Sticking to a Mediterranean diet may not just be good for your heart, it may be good for your brain as well, according to a new study. Researchers in Spain followed more than 1,000 people for six and a half years, and found that participants who were on a Mediterranean diet and supplemented that diet with extra nuts or olive oil performed better on cognitive tests at the end of the study period than the control group, which followed a lower-fat diet. The study was published Monday in the Journal of Neurology, Neurosurgery and Psychiatry. "We found that a Mediterranean diet with olive oil was able to reduce low-grade inflammation associated with a high risk of vascular disease and cognitive impairments," said Dr. Miguel Martinez-Gonzalez, the chairman of preventive medicine at the University of Navarra in Spain and a study author. The Mediterranean diet is devoid of processed foods and bad fats, and high in whole grains, nuts, fruits and vegetables, legumes, fish and even red wine - all things that are high in antioxidant and anti-inflammatory compounds. These types of foods are known to help reduce vascular (circulatory) damage, inflammation and oxidative (free radical) damage in the brain. 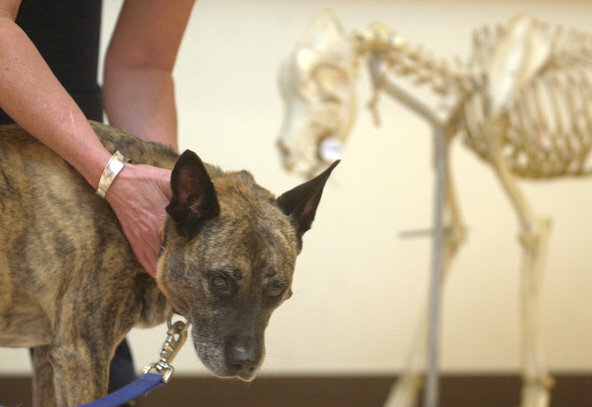 Did you know some Chiropractors adjust animals? One morning last August, Mary Arabe's 9-year-old gray and black tiger cat, Leo, came home from a night out exploring with a severe limp and an elbow swollen three times its normal size. He was clearly in pain; Ms. Arabe thought he had dislocated his shoulder during a fall. She took Leo to the veterinarian, who said he could do nothing for him. Despondent, she took him to Rick Tsai, a chiropractor in Darlington, Pa., who a few years earlier had adjusted Ms. Arabe's puggle, Bustar, after a head and neck injury. An X-ray found no broken bones, but there was a large amount of swelling and fluid retention. Dr. Tsai couldn't make any promises, but he placed his hands on the cat's spine, hips and neck and manipulated the joints until they popped. Millions of people swear by their chiropractors, and chiropractic has long been a mainstay in the equine world, especially among show or racehorses. Now it is gaining popularity among pet owners, as a way to treat household pets suffering from arthritis, sprains, joint pain and other ailments. While the backpack is necessary for school, it can also cause health problems. More than 50 per cent of young people will experience at least one episode of lower back pain by the time they are teenagers. Wearing a heavy backpack can reduce blood flow, contribute to poor posture, cause numbness in arms and distort the natural curve of the mid and lower back. Carrying weight that isn't distributed evenly or properly can strain muscles, lead to nerve damage and cause back, neck, and arm pain. A heavy backpack slung over one shoulder, for example, forces the muscles and spine to compensate for the uneven weight; this stresses and can cause pain to the mid and lower back. Is it positioned below your child's shoulder and above the hipbone? Is it made of lightweight material? Does it have adjustable, padded shoulder straps that are at least two inches wide? Does it have a padded back for added protection and comfort? Does it come with a hip strap or waist belt, which would help redistribute the weight or contents? Does it have several individual pockets instead of one large compartment? Does your child carry the backpack over both shoulders? Can your child stand upright comfortably while wearing the backpack? If you answered no to three or more questions, consider the following tips to ensure that your child is carrying the right knapsack. Make sure the backpack weighs less than 10 per cent of your child's body weight (or less than 15 per cent for high school students). Avoid leather knapsacks; choose a lightweight material. The backpack should be proportionate to your child's body size. It shouldn't rise above the shoulders or extend below the hipbone. Pack the heaviest or bulkiest items closest to the child's back. Ensure your child wears both shoulder straps. To put the knapsack on, a child should place it on a table or chair, bend at the knees and lift with the legs while putting on one shoulder strap at a time.